What a person sees in simple images can actually reveal a lot about their personality. This is the whole premise behind the Rorschach test. Psychologists use a wide range of images to create a personality profile that is, more often than not, extremely correct. “I first came across the Rorschach inkblot test when I was training to be a clinical psychologist. I was shown a series of cards containing inkblots and asked to say what they looked like to me (Tester: “What does this look like?” Me: “A bat.”) I remember thinking that it felt more like a tarot reading than a proper psychometric test. Now, the image below will not be nearly as correct as a professional Rorschach test, but it will reveal something interesting about your personality. Take a look at the image below quickly. Remember the first thing you see. …you may be a creative person with a strong imagination. If you do not currently work in an artistic field, it might be time for a switch. This is especially true if you find your current employment stressful. Think back to what you enjoyed doing when you were younger. Did you like to sing or dance? Maybe you enjoyed painting? At the very least, you might want to try taking up your old passion as a hobby. You will be happy you did. …you also have a strong imagination, but logic is at the root of all your actions. You see what is there first, but are able to imagine more. Your sharp mind and rational makes it common for others to turn to you for advice. You can remove yourself from the most complex of situations and find an answer that works for everyone. You do not easily panic and instill calm in others when an emergency arises. This is an amazing trait that others see and admire. That is why you are often made the leader even if you think others are better for the job. …you are extremely observant. No one can hide anything from you because you notice all the little details most people miss. You know and see all. You are also highly aware of the feelings of those around you. Because of this, you know exactly what to ask and when to ask it. You could easily use your skill in the business world to succeed financially. However, for those of you who want to use your powers for good, you may want to look into counseling. …you need to take a vacation. Not being able to see something in the image above means your brain is tired and unable to perform complex tasks effectively. Have you been getting angry easily? Do you have a hard time seeing a problem from a different perspective? These are all signs that you are overworked. Plan a personal day. Call in sick if you have to. 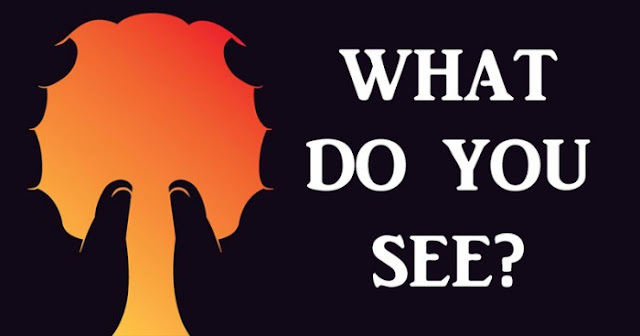 So, what did you see in the image above? Did you see something that we didn’t mention? Write your answer in the comments and share this with your friends! You may learn something new about them! I seen both thd tree and hands at first glance..pretty cool. I saw an elephants head .. I see a palm tree as well as elephant head. someone has eat the apple !!! Tree first, then it immediately shifted to hands. I thought: not quite a tree, hands around a cloud / explosion. Guess that means I'm a mess and can't decide which way to go. I hate this kind of thing, it always makes me feel off. FWIW, I always follow my intuition.